Action Fire Protection was incorporated in 1977 by Dale Fullerton, our founder. Dale started the company after 20 years in the fire protection business. Action Fire Protection is an open shop fire sprinkler contractor. We are licensed in the state of California for: complete design, installation, fabrication, repair and inspection of all automatic fire sprinkler systems. These systems include: Fire Pumps, Standpipes, High Piled Storage Upgrades. Our team of professionals do everything from service, inspection and maintenance to very large construction projects. It is the quality of our personnel and their ability to perform at a capacity far above the norm on any given project that sets us apart from others. We provide competent and professional services to our customer to do the job properly, on time, and at a fair price. AFP stocks a large quantity of all types of pipes & fittings, sprinkler heads and other components in our warehouse and trucks. 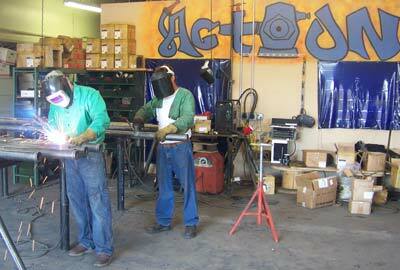 AFP fabricates all types of pipe and fittings in our Fab Shop. AFP works closely with the local fire departments to keep up with specific code changes and other city or local policies that affect you. AFP is a member of the National Fire Protection Association (NFPA) and is a subscriber to the code change service. This helps us keep current with any changes to the NFPA code, and as a result, ensures your structure to be safe and up-to-date. AFP has highly skilled employees. Our work is radio-dispatched so communicating with the customer and office is efficient. Please call for a free list of satisfied customers who will back up our work.